BBC NEWS | Health | NHS reforms - a case of deja-vu? NHS reforms - a case of deja-vu? There needs to be a shift away from hospital treatment towards more community-based services, the Labour health secretary said. But these were not the words of Patricia Hewitt, rather her predecessor from 30 years previously, Barbara Castle. Ms Castle was presenting a consultation paper in 1976 calling for a greater focus on primary care just as Ms Hewitt is expected to do with the forthcoming white paper on out-of-hospital care. The truth is the vision to be set out by Ms Hewitt to reduce unnecessary hospital admissions by improving access to community services from GPs to mental health clinics is a message that has been repeated by ministers for the last three decades. Alan Maynard, professor of health economics at York University, said: "We have to get admissions down, but that is what we have been saying for years. "It is remarkable that it has still not been solved. I always joke it needs Sooty to come and wave his magic wand." While the 1976 Priorities for Health and Social Service document - published during Harold Wilson prime ministership - was unequivocal in its call for hospital stays to shorten and more treatment carried out in the community, particularly for those with long-term conditions, the changes did not materialise. The Black Report, an inquiry into health inequalities in 1980, blamed a lack of clear objectives and responsibility to ensure the shift took place. But the failures did not stop subsequent Tory administrations and Tony Blair's Labour government from attempting to alter the hospital bias that has existed ever since the NHS sprang into life after the Second World War. 1984 Griffiths Report - Called for GPs to get more involved with budgets and commissioning services so that care could be built around community services. The 1984 Griffiths Report on the NHS called for GPs to be given more autonomy to help build up community services. This was subsequently done in the 1987 white paper, Promoting Better Health, which gave dentists, nurses and GPs more control of funds to set up their own services. Social care was given its own boost two years later when a white paper called for extra investment to allow people to be cared for for longer in their own homes. During the 1990s, ministers went one step further by giving GPs their own budgets - GP fundholding - to commission services, a scheme scrapped by Labour in 1997 only to be reintroduced seven years later under the guise of practice-based commissioning. The 1996 Choice and Opportunity White Paper called for alternative providers to be set loose in primary care, prompting headlines that Boots and Tesco would get involved in NHS community services. But there was little momentum to the push as the Tory government was in its last throes and in the end only nurse-led practices offered a challenge to the GP hegemony. Not to be outdone, Blair's government has been no stranger to primary care reform. A white paper in 1997 attempted to put New Labour's stamp on the NHS by dismantling much of the so-called internal market and setting up primary care groups, later to become the 300 primary care trusts in existence today, with the aim of building the NHS around local services. GP autonomy once again became fashionable with the introduction on the GP contract in 2004, which offered the incentive of extra money for providing specialist services - a move which is expected to be built on with the white paper. But the long-battle to redefine community services prompts the question - why should this attempt be any different? Some believe the government's latest policies are more sophisticated that past attempts. King's Fund researcher Richard Lewis said there is much to be proud of about primary care - pointing out satisfaction ratings are at high levels - but believes schemes such as practice-based commissioning will not repeat the mistakes of GP fundholding which set doctor against doctor, creating a two-tier system. "People complained patients of fundholders would get quicker treatment than those down the road. I suppose the difference this time is that we are seeing doctors who have got their own budgets getting on board in clusters which means the differences are less noticeable." And Dr Mike Dixon, chairman of the NHS Alliance, which represents primary care professionals, believes the medical profession - traditionally a conservative beast - is more prepared to adopt changes across the board. "In the past, the good schemes have only been taken up in certain areas. The difference I get at the moment is that the NHS as a collective group is moving in the same direction." Dr John Chisholm, a former chairman of the British Medical Association's GPs committee, accepted family doctors were conservative and had failed to grasp the nettle on occasions, preferring to concentrate on clinical rather management responsibilities. But he said bad policies had also played their part. 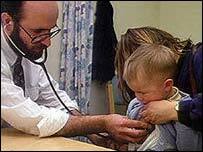 "Doctors have been pitted against doctors as policies have been badly thought out. "I can't see what this white paper can offer that has not been tried before." However, Dr Hamish Meldrum, the current chairman of the BMA's GPs committee, had more sympathy for the government. "Situations change. People are living longer today than they once were which means more people are living with multiple long-term conditions. It is only right we try to design a health service which can respond to that."